With 3 MotoGP championships (and 2 more in 250cc) there is no doubt that Lorenzo is a champion. And to just make it clear, he backed his words with an astounding win at Mugello three days later, followed by two more wins at Catalunya and Austria. But how much of a champion is Lorenzo? How does Lorenzo compare to other champions? To answer that question, I used the freely available data at motogp.com (for some reason it doesn’t work on Firefox) to collect all MotoGP and 500cc winners (until the Brno round). I labelled a champion anyone with at least 25 wins and I plotted the accumulated number of victories per year, highlighting Jorge and any other champion. This plot shows the reigns (from the year with the first victory to the year with the last one) of each rider. A rapid ascend implies a large number of victories during that time period. On the other hand, a “plateau” indicates lack of victories (see Valentino struggling with his Ducati in 2011-2012). We can see that Jorge Lorenzo (with 47 wins) towers on top of Casey Stoner (38 wins), Marc Marquez (40 wins), and Dani Pedrosa (31 wins). Only Doohan (54 wins), Agostini (68 wins), and Rossi (89 wins) have more victories than Lorenzo. As a side note, it is interesting to see Dani Pedrosa -who has never won a championship- to rank 8th in total number of victories, level with Eddie Lawson and with more victories in his pocket than Schwants (25), Wayne Rainey (24), Freddie Spencer (20), or Alex Criville (15). To better compare the reigns of the different champions I shifted all the reign lines so they start together. 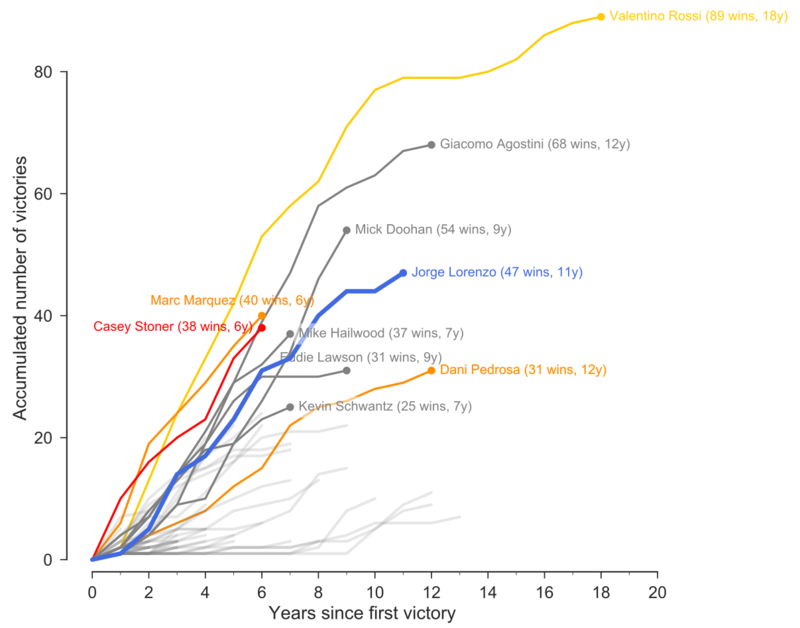 From this last plot (with champions who fought against Lorenzo also coloured) we can see that both Marquez, Stoner, Agostini, and Rossi remained above Lorenzo throughout their careers. This means that at the same year since they started their reign , they had more victories than Lorenzo. For instance now Marquez has 40 wins (on the 6th year since winning the first race), and Stoner had 38 when he retired after the 6th year of his reign, compared with 31 for Lorenzo at the 6th year of his reign. Lorenzo rate of victories per year throughout his career compares best with the 7 year reign of Mike Hailwood, which ended abruptly when he took a sabbatical year paid by Honda and moved to car racing. The first 6 years of Lorenzo’s reign are also similar to the first 6 years of Eddie Lawson reign. However Lorenzo has won another 16 races from the 7th year onwards, while Lawson spent the 7th and 8th year of his reign without a single win, and he could only add one more in the 9th year. Lorenzo also kept a winning rate similar to Doohan’s during the first 7 years of their careers, but Lorenzo flattened a bit from the 8th year compared to Doohan relentless increase in victories during the 8th and 9th year of his reign, which ended abruptly when he had to retire due to injury (video in Spanish, and well… it includes a heavy crash). Doohan piled 54 wins during his 9 year reign, compared with 44 wins for Lorenzo during his first 9 years. But all reigns, including Lorenzo’s, pale in comparison with Rossi’s career. After 11 years of racing, Lorenzo counts with 47 wins. At the same point of his career Rossi had already won 79 races. Even Agostini’s 68 victories during his 12 year long reign can not compare with Rossis’s numbers. This shows how brutally successful has Rossi’s career been, specially during the first 11 years up to the “Ducati plateau” of years 12th and 13th. So yes, Lorenzo is a champion, no doubt about it. And to add to his credit, he managed to win 47 races while competing against 4 of the most successful riders ever, including an incredibly successful Valentino Rossi. Next PostNext Lorenzo through Lorenzo’s eyes.